It’s hard to believe my boyfriend and I are in in our 5th month of living in our new place! For the most part, we’ve got things set up the way we want them, but there are still adjustments being made and pieces being switched in and out. Our bedroom still needs to be painted (there’s WAY too much brown going on in this place – the entire living space, hall, and bedroom) and we are planning on switching out my 60’s wood table in the kitchen for my grandmother’s (also 60’s) laminate table once we get the table leg fixed. My boyfriend is welding us a side table for the living room to replace a little IKEA one that I’ve had forever. My studio is still a work in progress, but it gets better every week. One of the first things, however, that went up was my plate collection. I only had a couple of months to enjoy it in my old space, so I was sure I wanted to put it back up in the new kitchen. We had a perfect spot, too: right above the buffet behind the kitchen table. I put it up in the same arrangement and used my trusty 3M hooks and picture hangers that I used before. 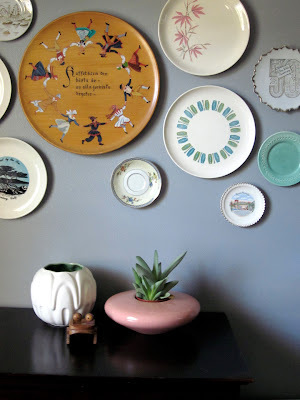 It was a little easier hanging them on this wall since the texturing wasn’t nearly as pronounced as it was on my old plaster walls. Just like before, I measured the center point of the space, decided on a height and put the large plate in the center. I worked outwards after that, mostly just eye-balling the spacing of the other plates. 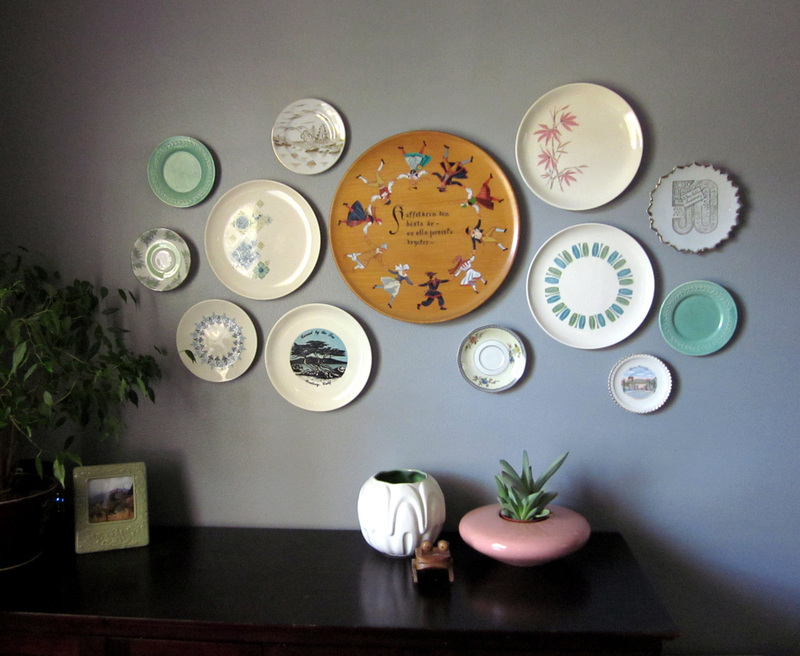 I didn't have to use any of the traditional plate hangers here, so they all appear to float on the wall! I think the blues and greens in the plates look really nice against the gray wall. There's an added bonus about this new set-up: I don't have to worry about the 4 washers and dryers above my apartment shaking the bejebus out of the walls and working the plates loose! I don't miss apartment living at all!